The Dalai Lama visited Silicon Valley to speak at Santa Clara University. 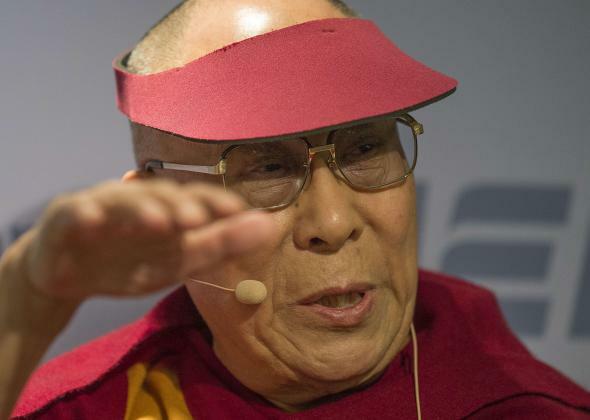 The Dalai Lama frequently rocks visors. He had one that said Santa Clara University on it for his talk there this week, and pictured above he sports one at an American Enterprise Institute panel from last week. Since we have a body and mind, we need that mental peace and physical comfort to which compassion gives rise. We need to educate people to increase their concern for others’ well-being. It’s not a message that comes up every day in Silicon Valley, but the Dalai Lama can offer life lessons in unexpected places. The San Jose Mercury News notes that the packed auditorium included students, entrepreneurs, Buddhist monks, and even celebrities like Ronnie Lott of the San Francisco 49ers and former Men’s Wearhouse owner George Zimmer. It really does sound like a group that could benefit from the Dalai Lama’s peaceful words. It is no longer adequate to adopt the view that our responsibility as a society is to simply further scientific knowledge and enhance technological power and that the choice of what to do with this knowledge and power should be left in the hands of the individual. And other people have also pointed out, that personal responsibility is not always enough to guide ethics in Silicon Valley, where venture capital funding and fat profit margins can be corrupting. Before his panel appearance at Santa Clara, the Dalai Lama spoke outside the auditorium to some of the university’s students. He said, “You are the generation who manage this world, so you work hard. Have vision … this century can be more compassionate.” Make it happen, youth of Silicon Valley. And everyone.